32 songs sung by Great Rafisahab for less famous heroes on 32nd Death Anniversary. This entry was posted on Tuesday, July 31st, 2012 at 12:01 am	and is filed under Meri Awaaz Suno. You can follow any responses to this entry through the RSS 2.0 feed. You can leave a response, or trackback from your own site. Excellent collection, I guess the song “Tu is tarah se meri” for Deepak Parashar and some songs sung for Raj Kiran, Vinod Mehra, Farrukh sheikh should be added. Rafisaab is simply the greatest thing the world may have ever heard! Na fankaar tumsa koi or aya md rafi tum buht yd aye. oh, there’s another in shagun. tum chali jaogi, parchhaian rahe jaegi – also filmed on kawaljeet. the soul-value of the song is immense. and there is mai yeh soch kar uske darse utha tha in haqeeqat – on sudhir. thanks for rare melodies of rafi saab,in fact all lesser known artistes were made great heroes by rafisaab with his golden voice….rafisaab ne jisk gane ko bhi gaaya wo sona ho giya…..
Great effort. I just remember another: MERE PAHELUME AAKE BAITHO KHUDAKE VASTE, filmed on Rupesh Kumar in Rustam-e-Hind(1965). Thanks for the singer information.I have the entire collection of this list. Some years back HMV came up with a two cassette collection under the title “Rare gems of Mohd.Rafi “. Most of these songs are available in that set. The reason that Rafi has become immortal is precisely this.He never tied or tagged himself with any single superstar or favorite music director of a particular time. Without being disrespectful to Pancham da and Kishore da (I love and respect them immensely), I can say this is the mistake they made. Take away the Burmans ,Rajesh Khanna and dev saab , not much of Kishore da is left. Take away Kishore Da and not much of Pancham Da is left. When Rajesh Khanna era ended and Bappi Da took over , no matter how great he had been Pancham was left in the lurch. 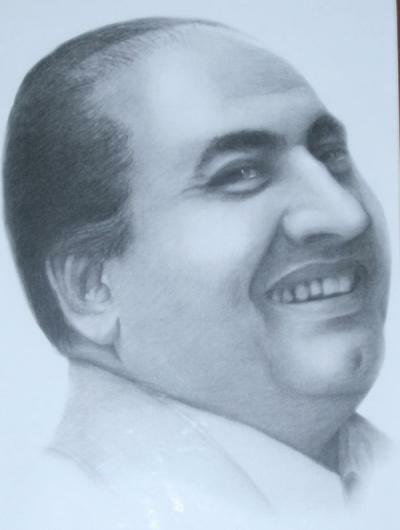 Mohd .Rafi is a unique divine soul . Rafi is beyond stars and commercial considerations. The above list proves his humility , humanity and devotion to music as a divine art first . I heard an anecdote about the song ‘Paas baitho tabiyat ‘. The music director C.Arjun went and stood outside rafi saab’s house. When he saw him coming out , he requested him saying that he was not a famous music director but could rafi saab sing for him. Rafi saab sang the song for free. The song takes our breath away. Another instance frequently quoted was about ‘caravan gujar gaya ‘. This was also sung for free. Rafi would take just one rupee (Not charging is considered insulting the profession). This lyric penned by Neeraj is considered one of the all time best lyrics ever written for movies. Long live Rafi saab . Millions lived the moments of their lives through your songs. In actuality, the number of such songs where Rafi saab has sung for lesser known actors is very high, but I appreciate the fact that on the 32nd ‘punyatithi’ of that divine soul you selected 32 songs. In addition to above there are innumerable number of songs picturized on ‘unknown’ artists (Allad hi allah kar pyare bhai…… from Pavitra Paapi, Main koi jhooth boliyan…… from Jagte Raho, Ajab tori duniya…… from Do Beegha Zameen etc. are some examples). All put together it is estimated that Rafi saab gave playback to more than 100 actors which is a world record. This fact is already/ or going to be documented in ‘Limca book of world records’. One can also get the feel of Rafi saab’s vastness by counting the number of music directors he has worked with. Even this figure will be in 3 digits. That was rafi saab… still alive through his songs and deeds. Great Job. Thanks.Wish to see all the songs to see the lucky heroes.Some of them I know but most of them I do not. Dear friend, thanks for sharing the names of actors on whom these songs were picturised. Remember listening to these lovely gems on radio during childhood/teen days. At time used to get surprised how come such beautiful songs can be made in C grade movies or such unknown faces ! Rafi Saab was great that he with his immortal songs even made those actors famous with these songs !